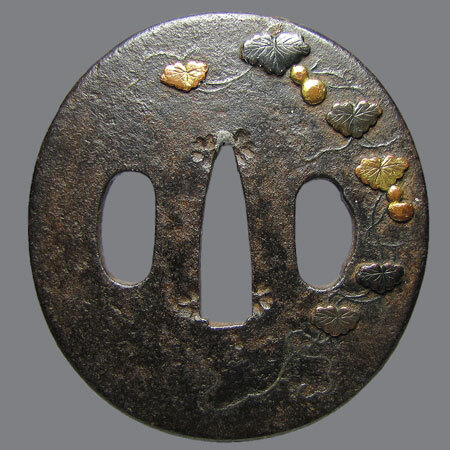 Iron tsuba with a picture of stems, leaves and fruits of bottle gourd, inlaid with different metals. After removing the seeds and drying them, gourds were used as containers for water, sake and medicine. 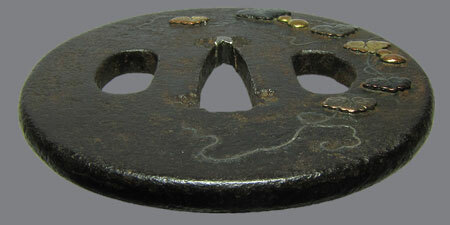 Besides, they were used as seed containers. It was considered that seeds kept in such containers always bloomed successfully. Thus the gourd begun to signify success to people. A set of three gourds are a good luck symbol as 三瓢箪 sounds as "san-byoshi sorou" (さんびょうしそろう) in Japanese. It sounds like 三拍子揃う, what means "being ideal" (literally - "meeting all three important conditions"). 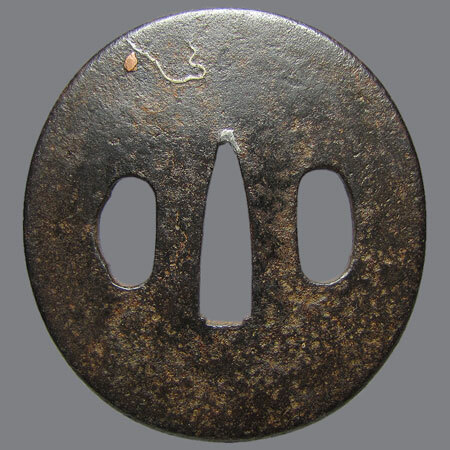 A set of six gourds is even a luckier symbol, because 六瓢箪 sounds "mu-byou" (むびょ) - it's the same as "no sickness" (無病). No inscription. Probably, one of the Shoami schools. 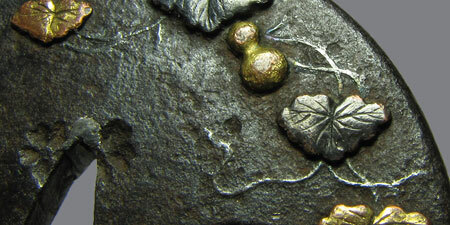 Iron, hira zogan with silver, zogan with shakudo, copper and gilding. Nagamaru gata, kaku mimi koniku; 6,3 х 5,9 x 0,4 cm.